Digga’s PD30 anchor drive and custom-designed tapered flight auger, complete with rock teeth, proved to be just the answer. 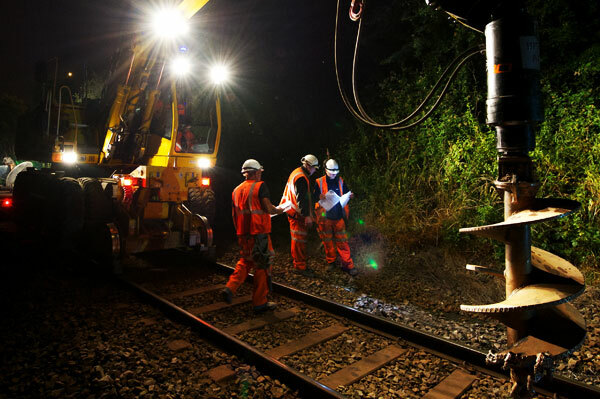 TXM Plant is erecting stanchions for overhead cabling on the Manchester-Liverpool railway line. It needs to make holes three metres deep by a metre wide, into which the concrete foundations are then poured. It started out by experimenting with a mix of hydraulic breakers, rock wheels and clamshell buckets. This worked just about well enough, more or less, but it proved to be slow and expensive work. There had to be a better way. TXM had a chat with attachment specialists Astra Site Services – and Astra, in turn, had a chat with auger manufacturer Digga to see what might work best. After a few experiments with various flights and auger drives, the combination of Digga’s PD30 anchor drive and custom-designed tapered flights, complete with rock teeth, proved to be just the answer. These augers are now almost doubling the original target of four holes a night and saving thousands of pounds worth of concrete. Word is that the augers have attracted a lot of attention from the rail plant industry and will be an integral part of the next phases of the electrification projects. To view more images from the railroad project, click here.